I don’t know many Pinoys who don’t like banana-que. For those of you not familiar with this uniquely Filipino comfort food, think of it as our version of caramel apples. But instead of apples, we use deep-fried bananas covered with caramelized brown sugar. Yum. You would be hard pressed to find anyone born the Philippines who does not have fond memories of this sugar-laden treat. When I came across a recipe for this street side delicacy in ice cream form, I tossed my freeze bowl into the freezer and got mixing. Instead of baking the slices of banana, I decide to cook them the way we make our banana-que, fried in butter while sprinkling brown sugar over each side as it sautes. Also, I decide to add a swirl of Nutella. Who can resist a banana and Nutella combination? Not me. In a large non-stick pan, saute bananas in butter. Slowly sprinkle brown sugar over both side of each slice. Cook until medium caramel in color. Transfer bananas and accompanying thick syrup into a blender or food processor. Add milk, granulated sugar, vanilla, lemon juice and salt and puree until smooth. Chill the mixture in the refrigerator and freeze it in the ice maker, following the manufacturer’s instructions. Once it reaches a soft-serve consistency, pour the ice cream in airtight storage container. Carefully, layer the Nutella syrup as you pour. The end result? 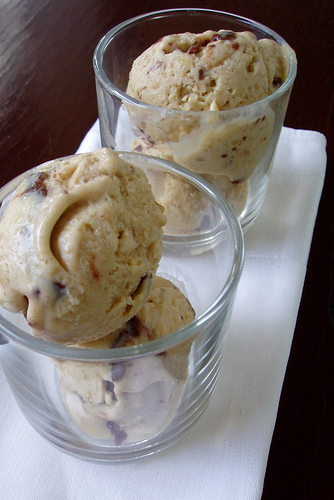 An amazingly rich and thick banana ice cream with a distinctive flavour of caramel. Not to forget, the occasional taste of chocolate nuttiness only Nutella can bring. 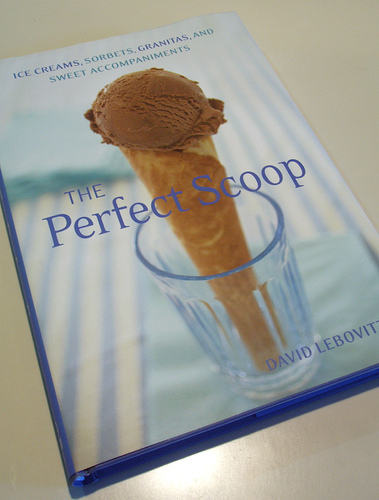 Just a short note about David Lebovitz and his tome, The Perfect Scoop. Mr. Lebovitz is simply a genius. And his book is a testament to that. I have found my personal bible to all frozen desserts. Mr. Lebovitz is truly an inspiration to us, amateur ice cream makers. Thank you, David. End of rave. Many, many thanks to my sweet A. You are the best. What would I do without you? Non-bananacue lover here. Actually, I'm no fan of whole/fresh bananas in general, so that includes, turon, minatamis na saging, etc. BUT I do love the flavor of bananas, so this ice cream sounds just scrumptious! And with Nutella, perfect! I have a friend that dislikes bananas in general because they're too dry a fruit (unlike other fruits that can easily be turned into shakes and juices with no trouble). Go figure. Hmmm. Non-banana people? Completely unheard of in my family. The recipe works for me. Like I said David Lebovitz is quite the inspiration. I'm only sorry I didn't discover this recipe earlier! I looks absolutely amazing! And the Nutella seems like the perfect addition!